Gladys Pearl Kimbrell Usry, 92, of Americus died Thursday, February 7, 2019 at her home. A native of Ocilla, she was born June 21, 1926 to the late Joseph Melvin Kimbrell and Mary Ella Young Kimbrell. 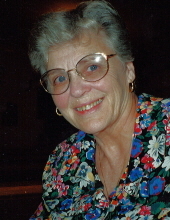 She was a member of Grace Community Church. Funeral services will be held at 2:00 p.m., Sunday, February 10, 2019 at Greg Hancock Funeral Chapel in Americus with Pastor Steve Hill and Pastor Wayne Swanson officiating. Burial will follow in Ellaville City Cemetery. The family will receive friends an hour prior to the service from 1:00 p.m. to 2:00 pm at the funeral home. Survivors include her daughter, Karla Ann Usry; son and daughter-in-law, Richard and Debra Usry; and a granddaughter, Kristen Nicole Usry-Roland and her husband Sam. In addition to her parents, she was preceded in death by her husband, Willis Franklin Usry in 2011. In lieu of flowers, the family suggests memorial contributions be made to Phoebe-Sumter Hospice, P.O. Box 1434, Americus, GA 31709. To send flowers or a remembrance gift to the family of Gladys Pearl Usry, please visit our Tribute Store. "Email Address" would like to share the life celebration of Gladys Pearl Usry. Click on the "link" to go to share a favorite memory or leave a condolence message for the family.